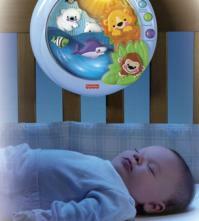 Nursery night lights are available in a wonderful array of colors and designs. You can choose a simple, unassuming wall-unit that won't draw any attention at all, or on the other extreme, you can go for a constellation night light and make it the star of the show. The choice is yours. Either way, make sure it is bright enough for you to see what you are doing but dim enough so that baby does not become wakeful or alert. Our Favorite Nursery Night Lights Online! Similar to conventional baby lamps, but with muted lighting, these are available in plain or decorative models to match your baby nursery design. These units are usually inexpensive and simply plug directly into the wall socket. You may have to remove this type of night light when your baby starts exploring nooks and crannies on his hands and knees. Also known as a light show or interactive night light. These units take several forms each with its own set of features. Usually there is a revolving bulb, which causes moving colors, patterns or pictures to be projected onto the baby nursery ceiling or walls. These appear to have a very calming effect on babies. Some attach to the crib while others are freestanding. Some have additional music, color changing and timer functions. The ultimate in nursery light shows, the twilight light projects around eight night sky constellations onto your baby's ceiling. The night light is attached to a cuddly turtle in the case of the turtle night light or a ladybug - as seen here. These snuggly little treasures are sure to become a firm favorite with your growing baby! Conventional baby lamps with a night light built into the base. Teddy bears with built in night lights. Clocks with built in night lights. Baby monitors with a night light built in. Crib mobiles with a built in nursery light show. The old faithful lava lamp. 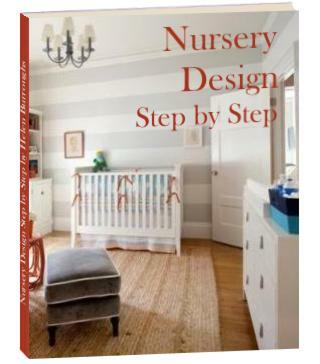 If you are planning a modern nursery this could work. The dimmer switch. An inexpensive, effective and versatile alternative. Paper Lanterns. String them along the wall - try something different. Fairy lights. Add a whimsical touch. A monorail with lighting pendants. Auto-sensor night lights switch on whenever there is not enough light in the nursery room. This ensures that baby can always see his familiar surroundings and you don't have to remember to switch the light on and off. Believe me, by the time you get to the end of a long night of ups and downs it's easy to forget. Other night lights even come with a motion sensor so they can switch on when they pick up movement in the nursery. This could be you entering the room in a bleary-eyed state, or baby stirring from his sleep. Either way it's really useful. Often the light cast by a nursery light show is too dim to bring out the patterns and colors properly. Make sure that your light show is bright enough before you buy it. Some baby night lights and nursery light shows have a revolving bulb, which casts moving patterns and colors over the nursery room ceiling and walls. Many nursery light shows have a music function. Some even give you the option to insert a disc or tape of your own choice. Some baby light shows allow you to choose and change the color of the patterns or pictures being projected on the walls. Babies like to be entertained. There isn't that much to do lying on your back on the crib. A change of color is sure to be welcome. There are some pretty nifty night lights out there with a timer or auto-shut-off feature built in. Great for making sure that the light does not stay on all night. If you are short of wall sockets these night lights solve the problem. 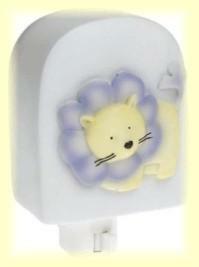 A touch operated battery night light is useful for sticking on the wall just inside the nursery room door. You press it as you enter the nursery. No groping for the switch somewhere on the other side of the room. 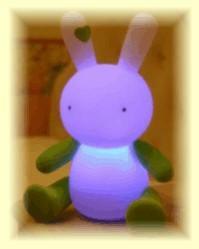 There are plenty of nursery night lights to choose from. Decide whether or not you want your night light to be decorative or just functional and do your homework before you buy. Check out our nursery chandeliers and other baby ceiling lights and baby lamps pages for your other nursery lighting requirements.